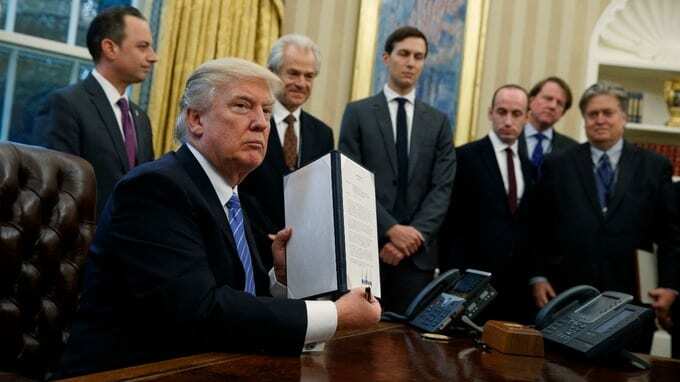 President Donald Trump suffered another legal blow on Thursday when a federal appeals court refused to reinstate his executive order temporarily banning people from seven Muslim-majority countries from entering the United States. This episode would be comical if were not so serious an issue. The 9th Circuit ruling, upholding last Friday’s decision by U.S. District Judge James Robart to suspend the order, does not resolve the lawsuit. It relates only to whether to lift an emergency halt to Trump’s order put in place by a lower court. Trump, who took to the Oval office on Jan. 20, faces long odds in getting the ban restored while litigation over his executive order proceeds. To ultimately win, the Justice Department will have to present evidence that people from those countries represent a domestic threat, legal experts said. The 9th Circuit judges said more legal arguments would be needed to decide the actual fate of Trump’s order. Meanwhile, Democrats, the minority party in Congress, celebrated. “This Administration’s recklessness has already done significant harm to families and undermined our fight against terror,” House Democratic leader Nancy Pelosi said in an emailed statement. A lot of uncertainty about how all this will play out, but we can be certain, Trump will not give up, watch this space. Social Media, is going wild with Donald Trump’s antics, and as you can imagine his persistent use of twitter; adds fuel to the fire. This presidential campaign has started like a good TV drama, you can’t wait for the next episode.